Stop by our tire store for discount tires! Get rolling at DePaula Tires - your Albany, NY area tire store. DePaula's Chevrolet Tire Service is a tire store that provides a wide range of tires and tire services in Albany, NY. We provide everything from tradition to airless tires. 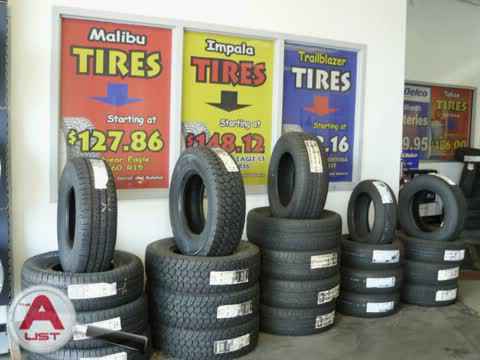 Our tire store also has a huge selection of discount tires and used tires to help you save money. We also carry a selection of brand name tires including Goodyear tires. So when you are in the Albany, NY area looking for a tire store that provides quality products and services, choose DePaula's Chevrolet Tire Service! Your vehicle's tires are what give your car traction and keeps it from sliding off the road. If old tires don't have much tread left, your vehicle can lose traction which increases the risk of an accident. It's important to stay on top of tire rotations and replace tires when necessary. It is important to properly maintain your tires. You should have your tires rotated every 5,000-7,000 miles. Tire rotations help to ensure the tires wear evenly. When you get your car inspected, sometimes you will need new tires in order to pass the inspection. When you need new tires, we have a huge selection of new & used tires to fit any budget. Are you in the Albany, NY area looking for airless tires? If so, rely on DePaula's Chevrolet Tire Service. Airless tires are perfect for smaller vehicles such as a riding lawnmower or golf cart, but can be used on heavy equipment such as backhoes or other machines where there is a higher risk for tire puncture. Call us today to get your airless tires or swing by and check out our inventory! When the time comes for new tires, you should have a good understanding of the tires you need for your vehicle. You can find your tire size on the OEM sticker on your driver's door. This sticker also tells the inflation pressure for the tires. Many customers don't know that tires have specific speed ratings. If you drive a sports car with a high top speed, you will need tires that are rated to handle that speed. The load rating on a tire tells the load capacity for a specific tire. The load index should always be considered when towing or heavy duty loading. Let a certified service expert from DePaula take care of your tire service needs today. Whether you want to check your tire pressure, rotate your tires, align your tires or install a new set of tires, our team is always willing to help. We make it easy for customers to find great deals on new and used tires. We also have name brand tires from Goodyear, Michelin and more. Our tire specialists are happy to help you find the best tires for your vehicle. If you feel like you need some used tires to save some money, then we are the place to check out! We provide a variety of quality used tires to upgrade your vehicle while saving you money! There are many times when buying used tires is the right choice. For anyone on a tight budget, purchasing them can be a wise choice and if you're low on cash or credit, it just might be the only choice. It is always the consumer's decision whether new tires or used tires are the option to go. We offer a personalized approach to customer service, because we take the time to get to know you. Our knowledgeable team in Albany, NY can help you decide what type of tires you need. DePaula Tires is open Monday through Thursday from 7 a.m. to 8 p.m.; Friday from 7 a.m. to 6 p.m. and Saturday from 8 a.m. to 5 p.m.
Our Capital Region tire service center is conveniently located off I-90 at 785 Central Avenue Albany, NY 12206. Please click here for a map. To find out more, please go to our website at http://www.depaula.com/, email trestino@depaula.com or call 518-545-4400. You can also visit us online at Facebook, Twitter and Foursquare. We have a huge selection of Goodyear tires & discount tires! DePaula Tires can provide discount tires that meet the specifications for your vehicle, so you can buy a new set of discount tires just like the ones that were on your vehicle the first day you drove it! Plus – with our 30-day tire price match – you can buy select discount tires and if you find a better price within 30 days, we’ll refund the difference. We even price match Goodyear tires! When you need reliable tires, you know you can count on Goodyear tires. Stop by if you are in the Albany, NY area and pick up your own set of Goodyear tires! Discount tires are ideal if you’re planning to trade in your car soon or if you suddenly have to buy a new set because one of your tires was damaged. We offer discount tires and used tires from some of the industry’s best brands. If you’re looking for great tires from a name you can trust, you’ve come to the right place. We will help you find the perfect set for your car in the Albany, NY area. We sell new and used tires from many of the best brands on the market. If you are looking for top-quality discount tires, your search ends here. We also sell airless tires that are ideal for smaller vehicles. Even if your budget won't allow you to buy new tires, you can still choose our used tires that are in great working condition. We serve clients in the Albany, NY area. Call us today for discount tires. With our prices, it’s like a tire sale every day! Please click here to check out coupons and service specials. Family owned tire store for more than 30 years! DePaula tire store has been family owned since 1980. We have always put the customer first. Our dedication to our customers is what makes DePaula different from other upstate tire dealers. We strive for complete customer satisfaction with every tire sale. We are proud to be General Motors’ 2010 and 2011 Dealer of the Year. Tire wear depends on several factors, including your driving style and tire maintenance habits. The wrong size load and speed rating can void your warranty. But one sure way to know when to replace your tires is when the tread-wear indicators (wear bars) appear. They look like narrow strips of smooth rubber across the tread and appear when it’s time to replace the tires. The tire has a bulge, split, puncture, cut or damage that cannot be correctly repaired. Since tires perform different tasks, they wear at different rates. Regular rotation allows them to wear evenly. This maximizes tire life and allows tires to be replaced in sets of four, which is preferable. If my vehicle is a 2011 model year or newer, is it okay to rotate my tires earlier than every 7,500 miles? Yes, particularly if you notice signs of irregular wear on your tires. I’ve heard that the first tire rotation is the most important. Why is that? Irregular tread wear occurs fastest when tires are new and at full tread depth. Thus, the first tire rotation has been found to be the one that matters most. Monthly is a good guideline. You can check your owner manual for specific information on your vehicle. Make sure the tires are cold (driven less than one mile) and don’t forget to check your spare. You should always use a good quality tire gauge to check pressure. Don’t ever try to “eyeball” tires; they can look fine even when they’re under-inflated. And remember that tires can lose air pressure in cold weather.